I have several fun Valentine’s Day ideas still to share with you but I’m putting that aside today to reveal another space in our new home. You can click on Home Resources and see any of the rooms that I’ve shared so far, in the last 3 months we’ve lived here. For the next reveal, I’m taking you on a little tour of our tranquil glam master bathroom. For those that follow me on Instagram (https://instagram.com/SummerAdamsDesigns) I’ve shared many views of this space during the construction process and I’ve shared the beautiful view outside these windows. The tall trees is the reason we nicknamed this our “Tall Trees Lane” home and why we chose this lot. 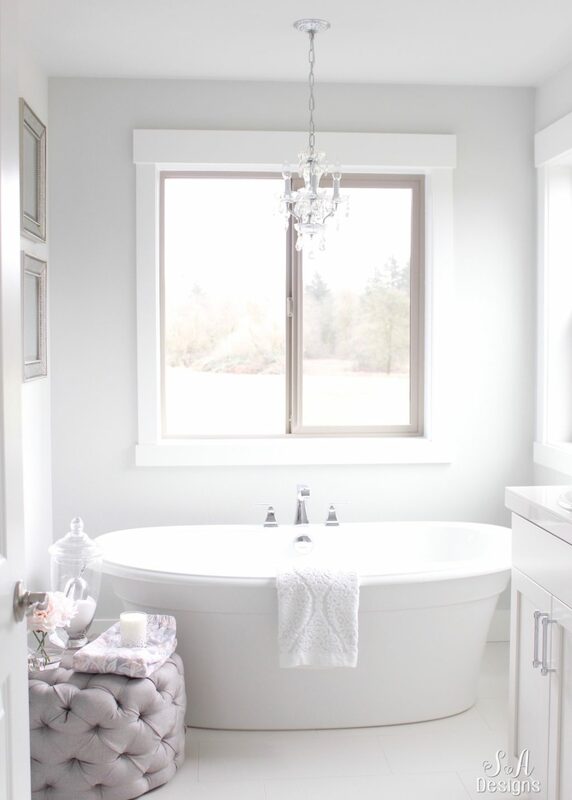 I chose a free-standing tub (Max Ella Sleek 105744 with a Delta 90º faucet) for this space and knew I wanted a chandelier to hang over it. I partnered with my friends at Crystorama, as I already have one of their chandeliers over my dining table and love it, and chose one of their chandeliers for the tub. 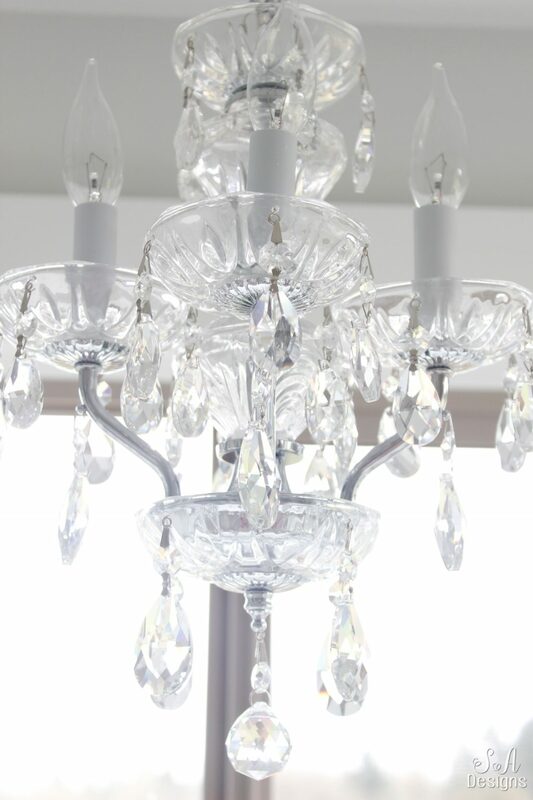 The one I chose was this gorgeous Crystorama Traditional Crystal 4-Light Chandelier. 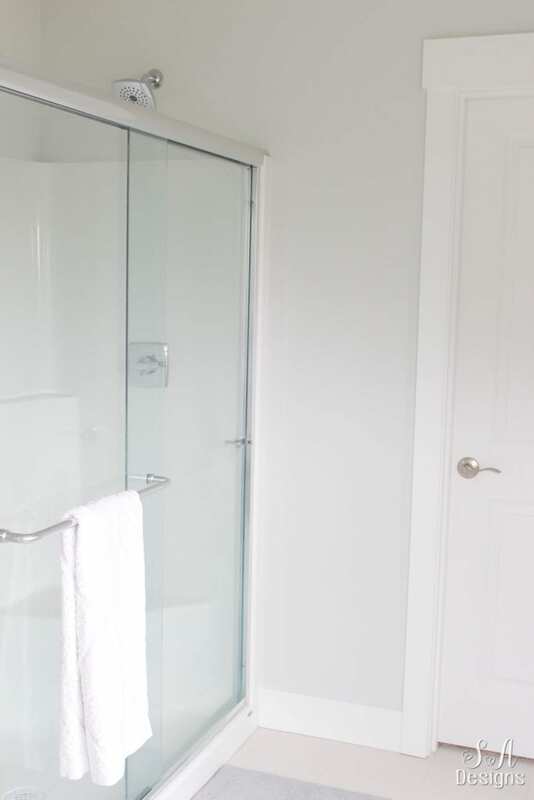 The crystal prisms are just divine and I love the way light bounces off of them and on to the rest of the bathroom. 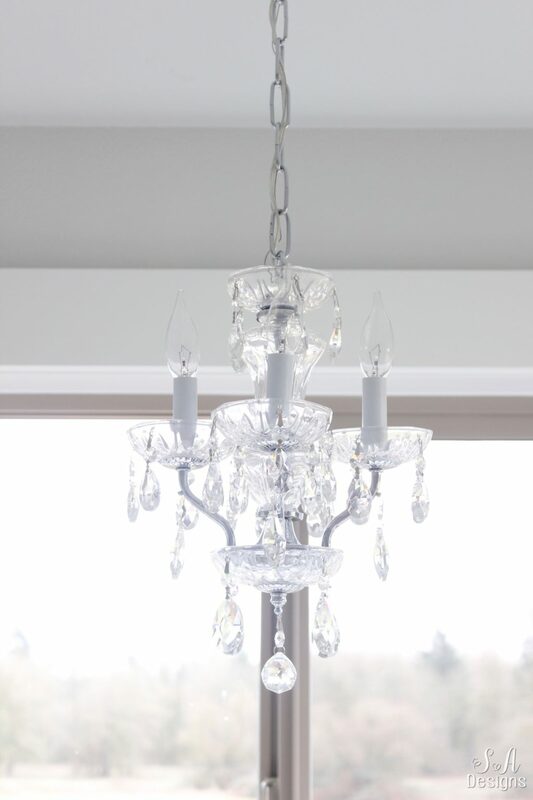 I originally thought I’d go with a chandelier just slightly larger than this BUT with this view and having 2 windows looking out at the Wetlands and tall trees, I didn’t dare want to block any of it. 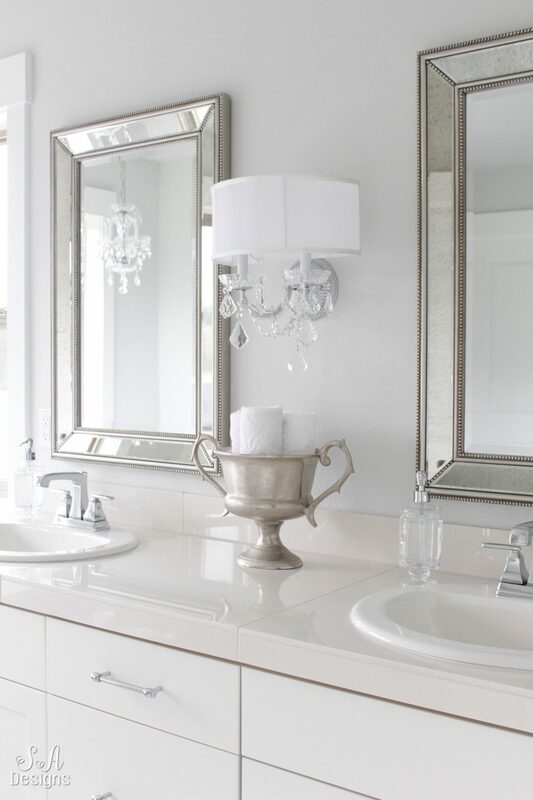 I only wanted to compliment the tub with this chandelier, like a single strand of pearls with a pretty dress. I love walking into the bathroom each day and seeing the sunrise (which I can actually see from my bed as well) and sunset, fog in the mornings covering the Wetlands, our neighbors beautiful horses…. I added a pair of lovely beaded square mirrors on the side wall. 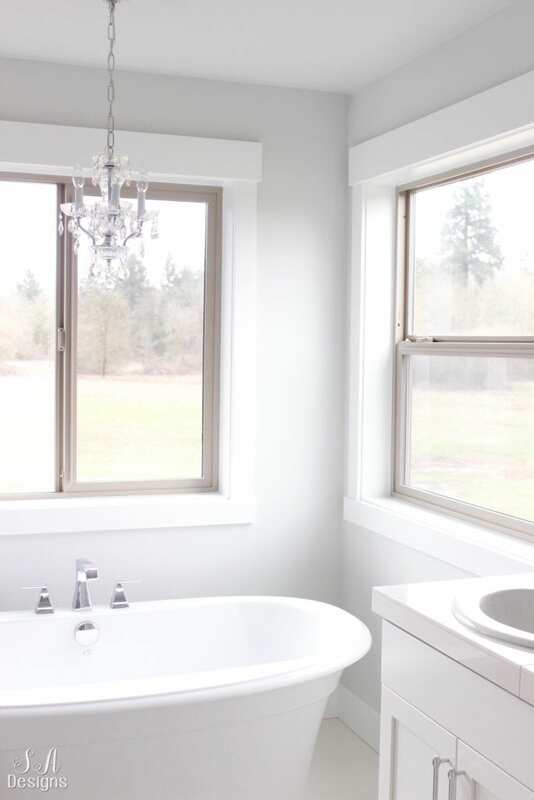 I love all the natural light that comes into this bathroom. Crystorama also sent me this gorgeous Brentwood 2-light Crystal Chrome Sconce for the middle of my vanity mirrors. 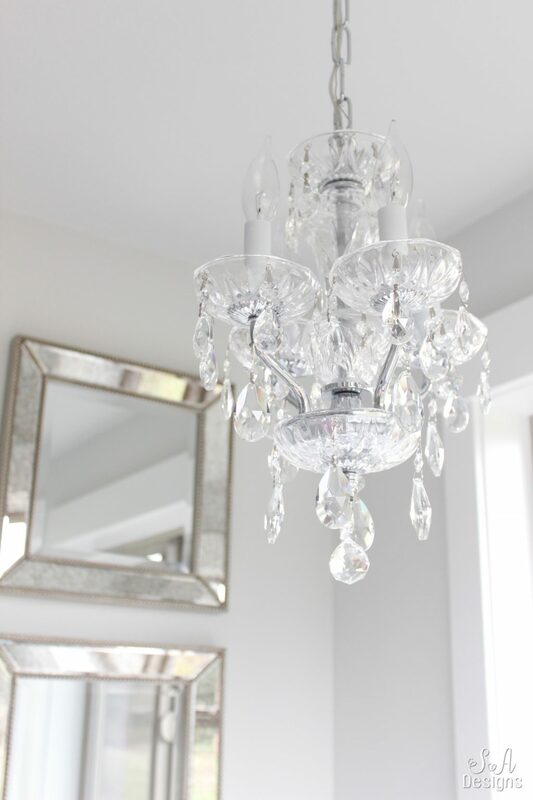 I love seeing the other chandelier in the reflection. I didn’t have room for wall sconces on the sides of the mirrors also, which was fine because I have recessed lighting above and get plenty of light. But that meant that I really wanted a statement piece, nothing simple but something with drama and elegance…something glamorous. This was the perfect light for that! I’m so thrilled with it. It’s made with Swarovski crystals and it is such a stunning fixture. I was worried about the lighting being “too glam” for my hubby but I was wrong. He walked in and his jaw dropped and he loved it. The word he used was “exquisite”. When looking for hardware for these cabinets, I knew I wanted polished chrome pulls to match the plumbing and other bathroom hardware. 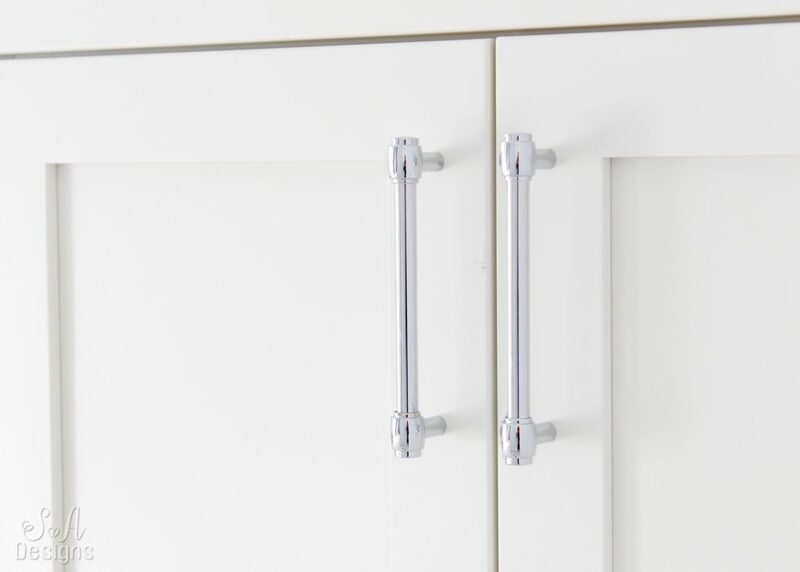 I went to Hardware Resources and came across these gorgeous, sleek Hayworth Chrome Cabinet Pulls and knew they were perfect. I was so glad they wanted to collaborate and send them to me and I knew they’d be a gorgeous addition to this master bathroom. They’re contemporary but elegant and I love the brilliant finish. I also used them in the laundry room and kids bathroom, which I haven’t revealed yet but will soon. I first shared a sneak peek of them in this post. Nothing fancy about our shower. It does the job. 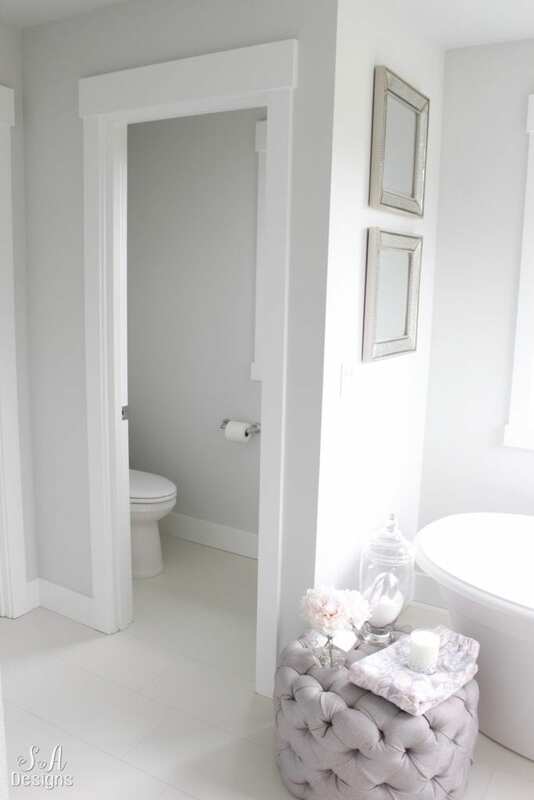 And to the right, behind that door, is our master closet and I can’t wait to share that with you! 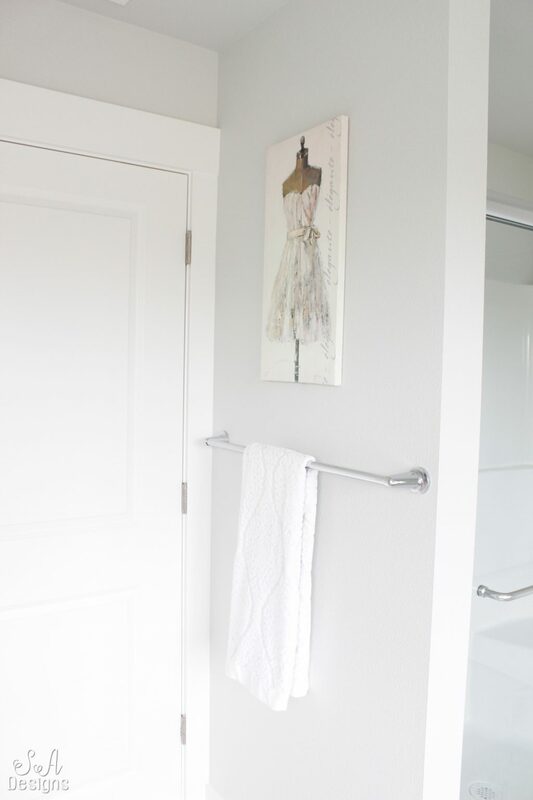 A towel bar hangs behind the bathroom door and I happened to still have a canvas art print in my “decor stash” that I purchased years ago and it fit perfectly here. Still looking for art for the wash closet. I love that there’s a small window in there so that it gets more light streaming in. 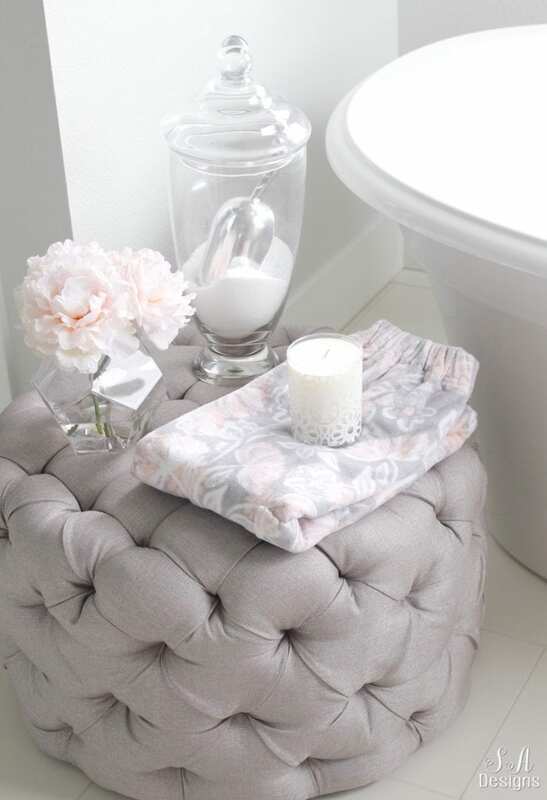 This gorgeous light gray tufted ottoman mostly stays in our master closet but I pull it out to rest my things on when I take a bath. I usually set a tray there with my water and maybe my cell phone. I definitely have a candle, always, and my bath salts and shower wrap. When I say this master bathroom is tranquil, I mean it! 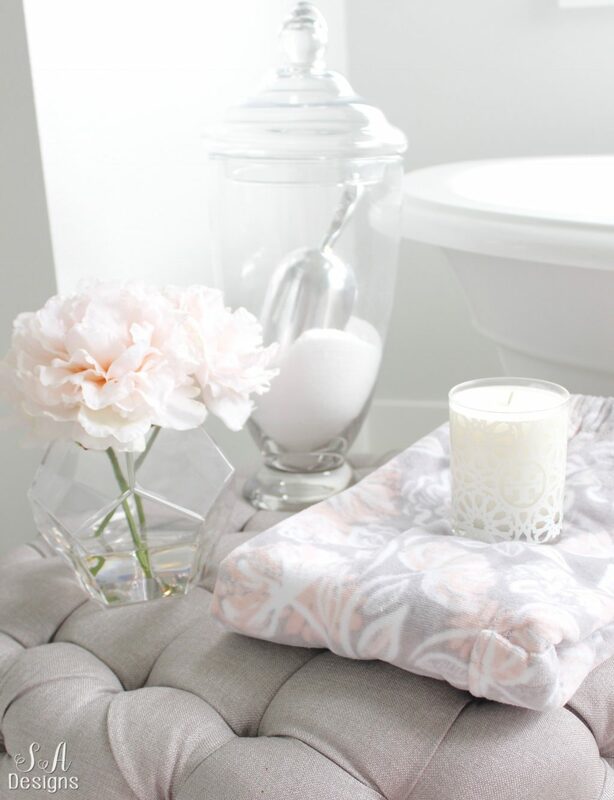 It has the elements I need to relax….a gorgeous view, neutral colors, lots of natural light, adorned with crystals, soft towels, and lovely-scented candles. I wanted everything to feel clean and tranquil and not busy so I used glass and chrome soap dispensers with clear soap. 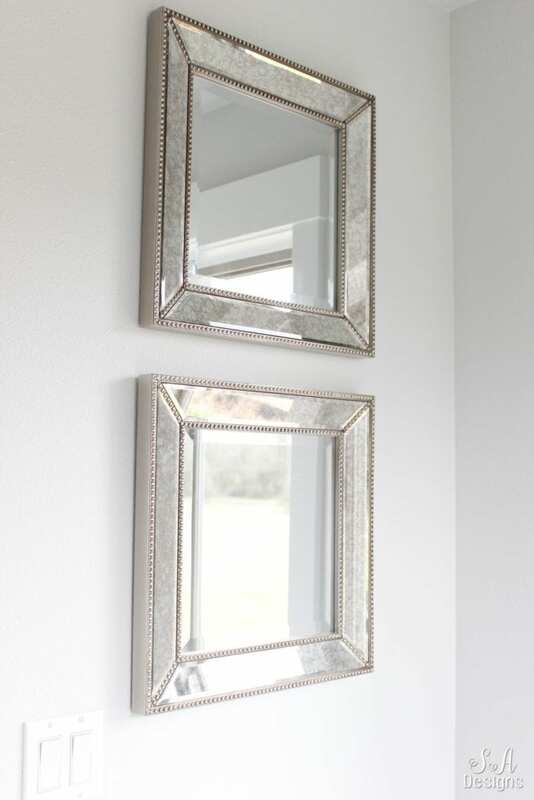 I found these gorgeous tall beaded mirrors with a distressed beveled edge which added to the that glam element. 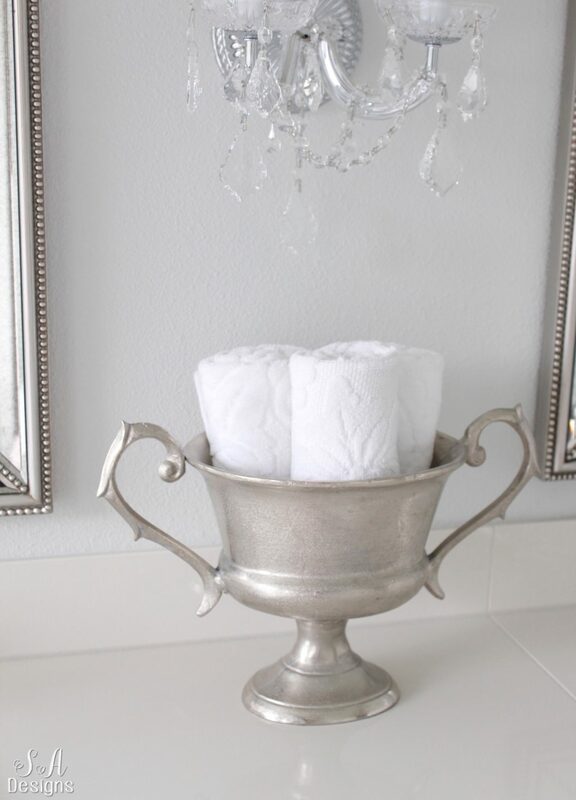 What once was an urn for flowers or plants is now the perfect piece for my rolled hand towels. Notice we chose the white tile for the floor and a shinier version for the counter tops, for now. We will probably change that down the road when I know what I want. I’m also looking for a backsplash in here as well as the guest bedroom, which I revealed HERE last week. I’m so pleased with how it came together and how tranquil it truly feels. 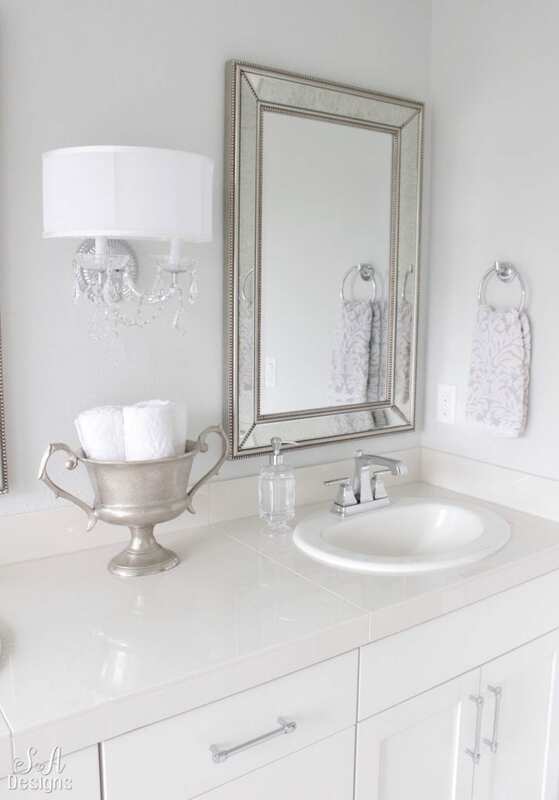 I love getting ready in my master bathroom! 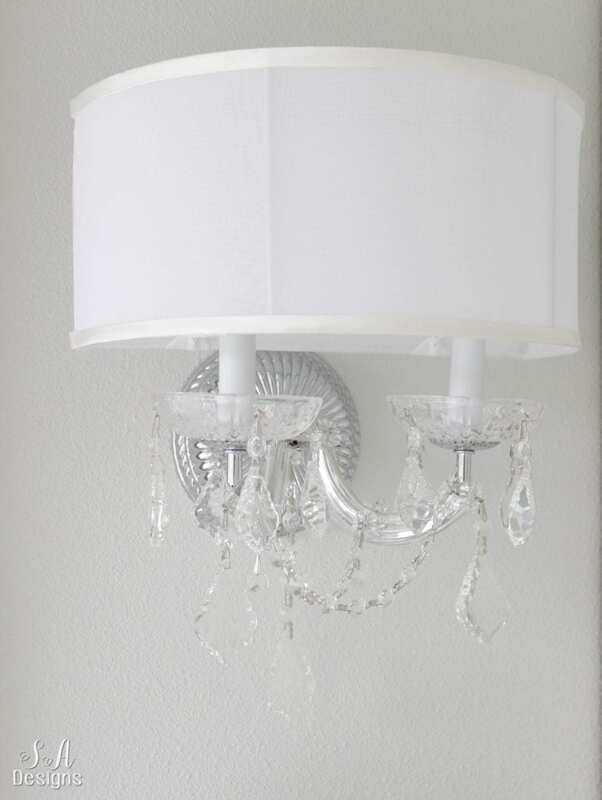 I’m so grateful to Crystorama for their exquisite lighting and encourage you to look for their pieces. And thanks so much also to my friends at Hardware Resources for the gorgeous hardware! 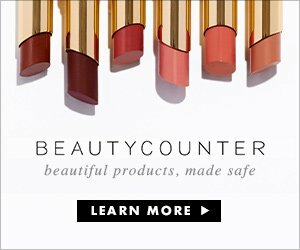 They have so many fabulous choices for your home. For your shopping convenience, I’ve added shopping links below. 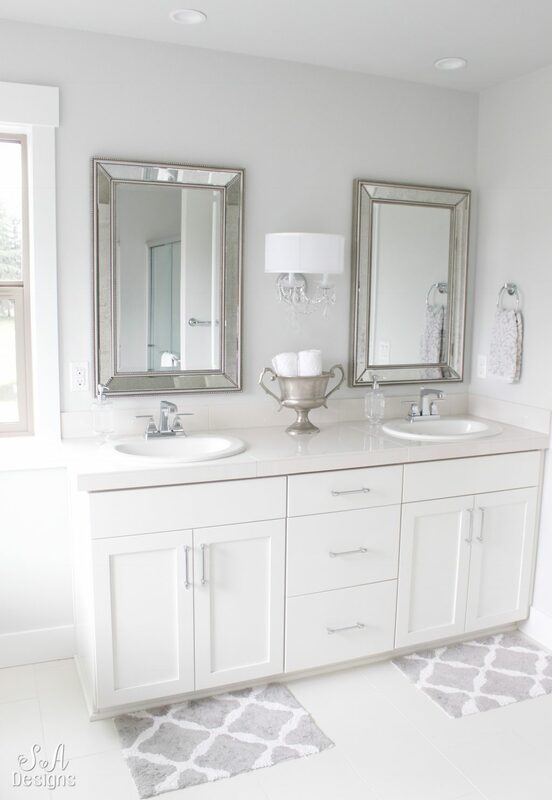 Your bathroom is stunning! We also are putting in a free standing tub. Could you tell me where you got yours from. Thanks! Your home is so beautiful. I love it. Beautiful..what is the paint color?! 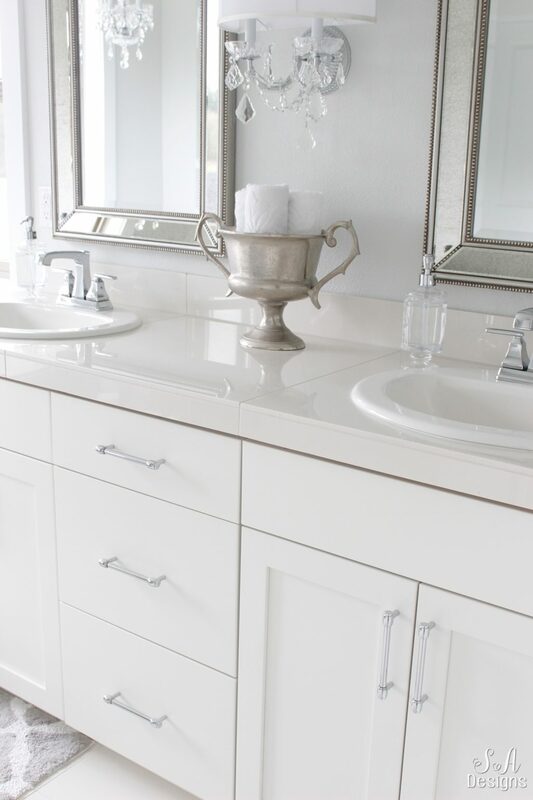 I love your free standing tub…I’ve been looking at them…can you tell me who makes yours? 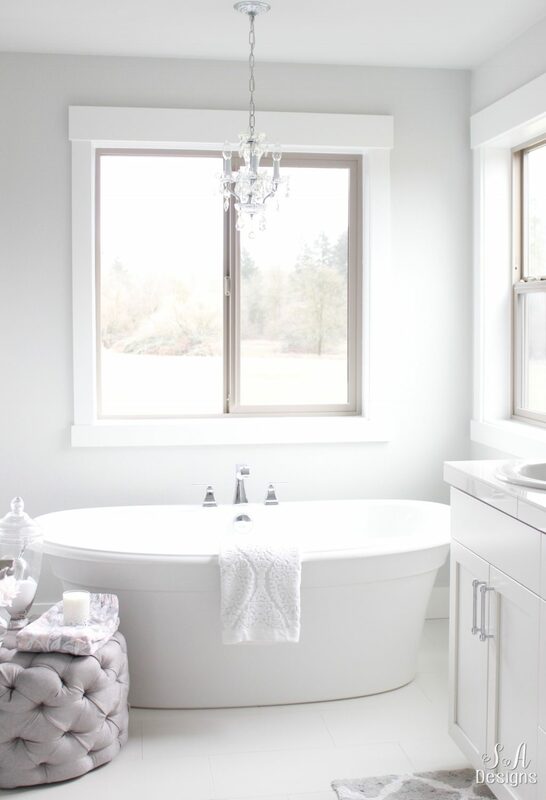 I really like that the faucet hardware in attached to the tub…most of the tubs I’ve been looking at have the faucet mounted to the floor or wall. Hi Alyson! Yes, let me find that info. I tracked it down a while ago for someone else and then forgot to edit the post and share the details. Sorry about that! One sec….